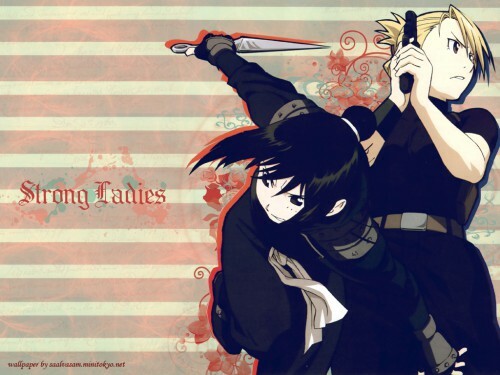 This one is a Lan Fan and Riza wall. Very very very simple. I like the colour and stripes in the background. The colour outline is nice too although I think you could have left some of the swirlies between them and it would still have been fine. Nice work. well, if there wouldn't be so much transparency, I'd grab it! they're actually one of my favorite characters in fma..
Love it! Looks great, and the poses are perfect. *______________* that cool! hawkaye 8d! Amazing Those two are my fav in fmab rally strong girls..